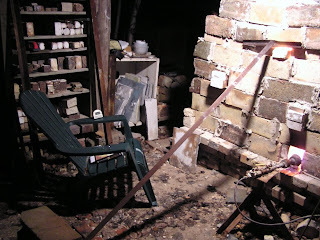 Thursday was a late night by the kiln, due to the car fuckery that prevented me from candling. But it was unseasonably warm, and I know how to make myself comfortable during the long wait between 05 & cone 8. The book is A Prayer for Owen Meany, by John Irving. What a lot of work that must be loading two kilns and then firing them, hope you survived and all is well inside. Cant' wait to see the results. Mighty Cold in Central Maine! Make Pots - Make Opportunities!